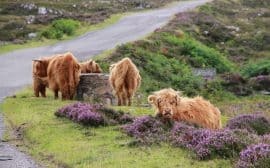 One of my core travel philosophies is that there are times to scrimp, and there are times to splurge. 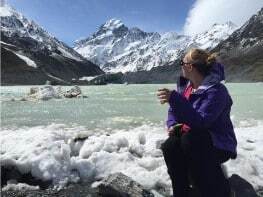 On most trips I take, I look for one or two experiences that will upgrade the trip from merely cool to truly epic. 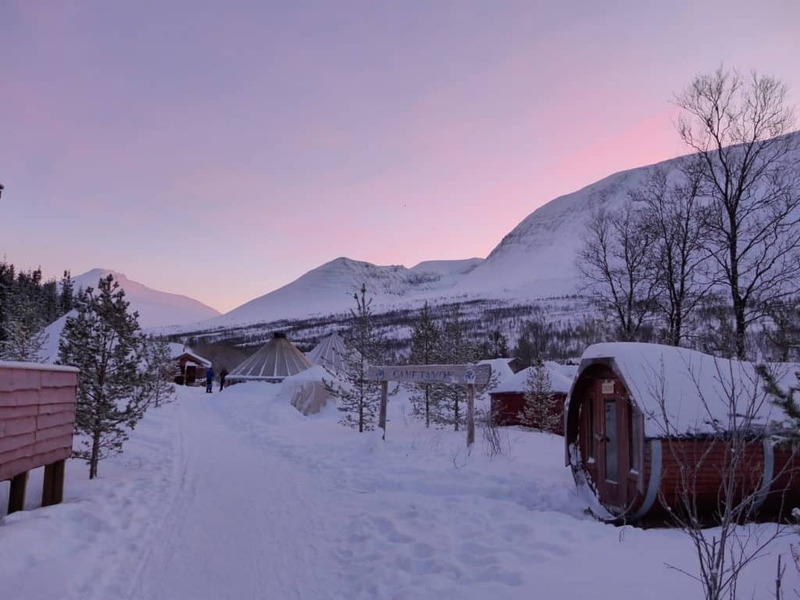 When we were planning our winter Arctic adventure to Tromsø, Norway, my research uncovered everything from dog sledding to Northern Lights tours to sleeping in a traditional Sami lavvu, and given our short time in the city I tried to find somewhere that could offer us a few of these things together. 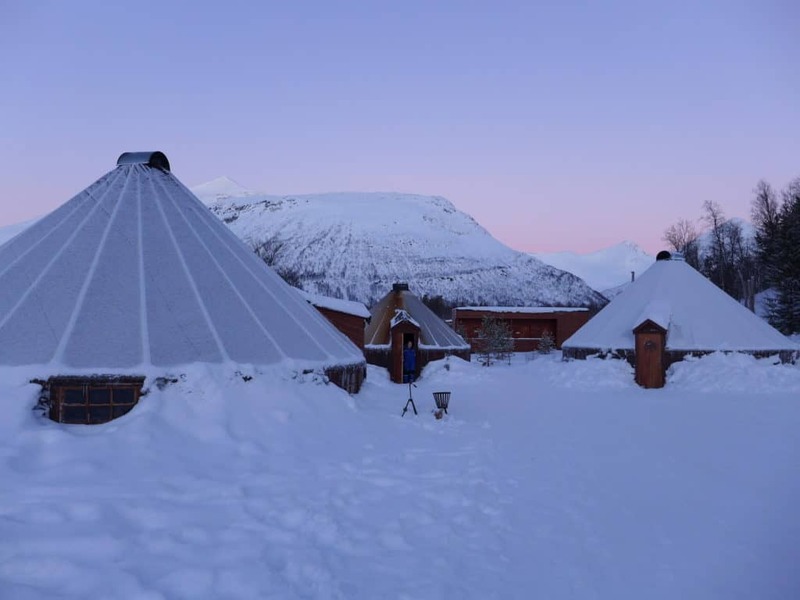 We were visiting Tromsø during polar night, meaning the sun never actually rises (or sets). Because we were only a few days from the area getting its first official hour of sun, it wasn’t actually pitch black the whole time. Instead, we were graced with a few hours in the middle of the day of pearly pink sunrise/sunset sky, and then it was pitch black the other 21 or so hours. So we really had to make use of those few hours of beautiful semi-light. We met the tour bus at Ishavshotel at a bit before 5:00pm, and everyone boarded for the 75-minute drive to Camp Tamok. It was pitch dark, so most people snoozed on the bus—I took the opportunity to catch up on some reading since the bus was very nice and equipped with reading lights. mittens and hats if needed. I totally dug their little fur ear-flap hat (modeled below), so grabbed one of those even though I had my own fleece headband. 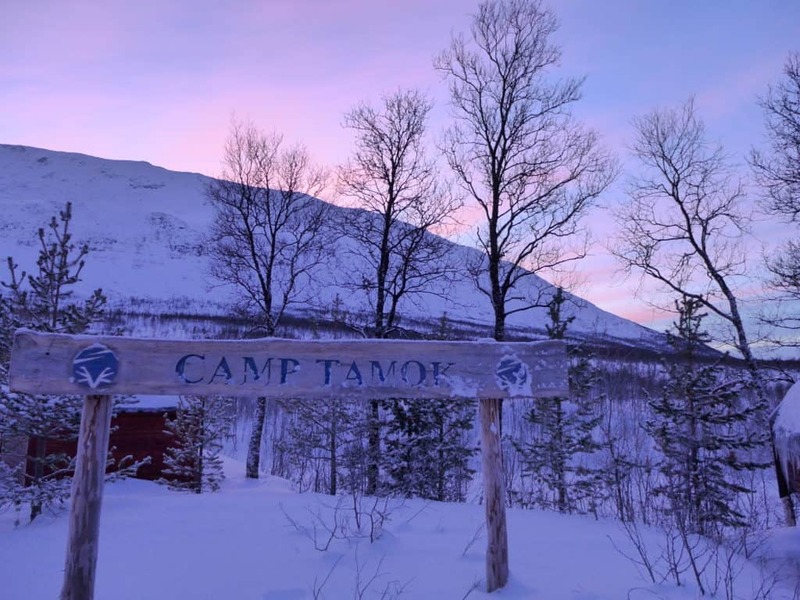 Camp Tamok is inland from Tromsø, so in a different climate zone than the coastal city, with more stable, drier weather and generally clear skies. 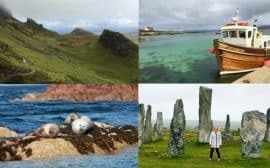 This makes it an ideal location for the first activity we had signed up for, a Northern Lights tour. So @FareWhispers and I got on a minibus with an American couple (what up John & Jenna?!) and drove around for a couple hours. 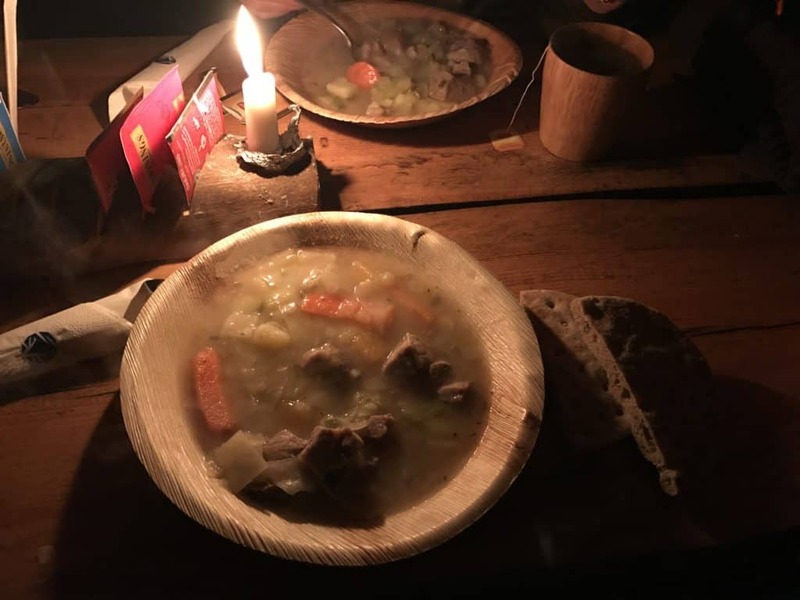 Unfortunately we struck out, and they wanted us to be back by 9:45 for dinner, so that portion of the Lyngsfjord experience was kind of womp womp (more info at the bottom of the post). Dinner, however, was not. 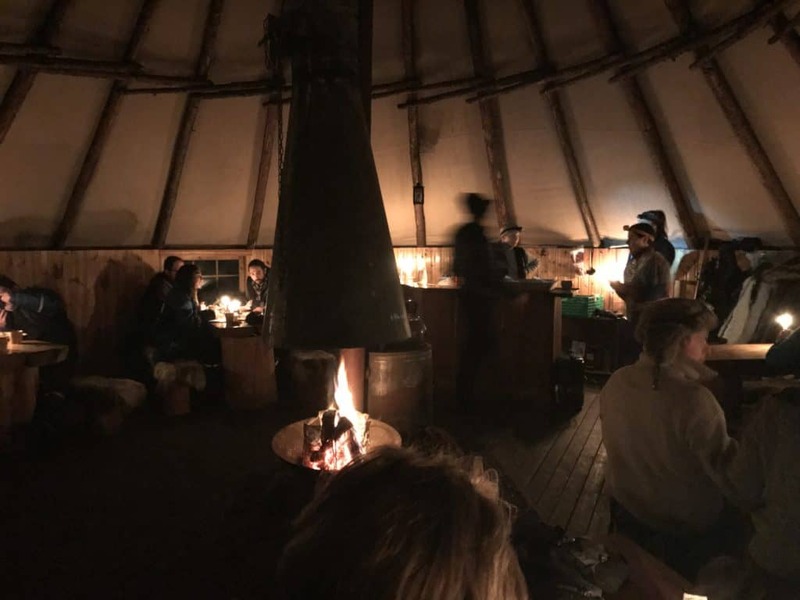 Cold from being outside so long, we ducked our heads and entered the large communal Sami tent, immediately enveloped by the warmth from the fire, candles, and cooking. As soon as we sat down at a table, someone came over to offer us tea or coffee, water, and lamb stew. We ate ravenously, and they readily offered seconds for anyone who wanted. We ended our meal with lefse, a delicious very thin bread (like a tortilla) filled with butter and sugar. After dinner our guide, Andreas, opened up the bar. 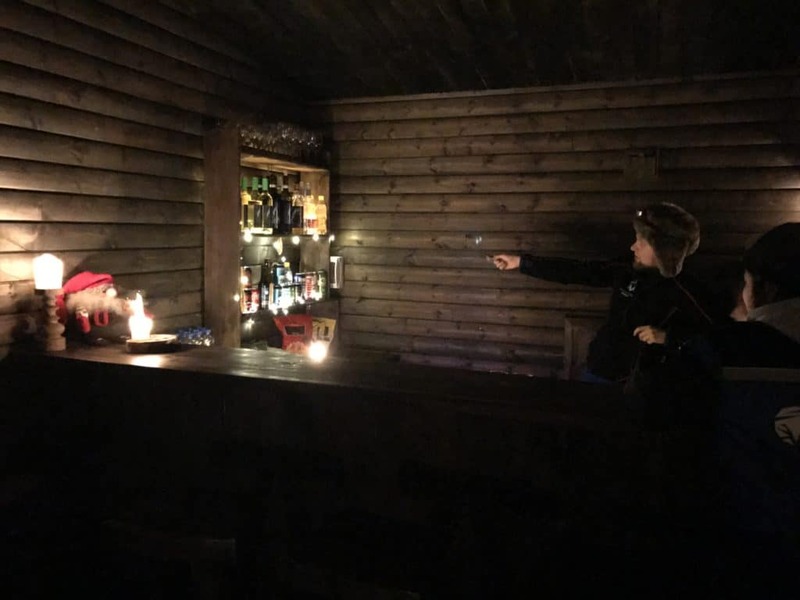 He stocks and runs this himself, and it’s an adorable little (chilly) cabin with big windows so you can keep an eye out for the Lights. We drank local beer and chatted with everyone there. There was a couple from Switzerland, a girl from Japan, and a couple others. 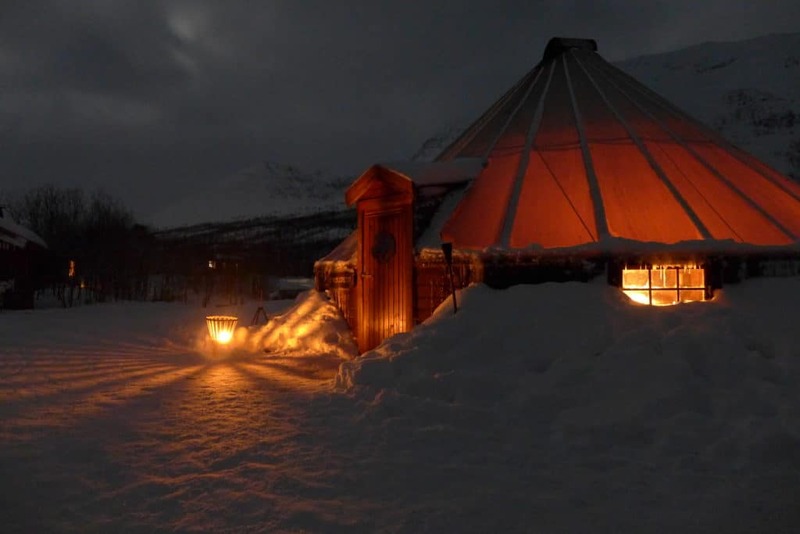 Finally, around 1:30am he closed up shop and we tucked ourselves into bed in our lavvu—traditional Sami tent. We were sleeping on reindeer skins with some blankets on top. It was comfy until around 4:00am when my hip started screaming from being on a hard surface that long. Thankfully someone came in a couple times in the night to tend the fire, and we stayed toasty and comfy until our alarms went off the next morning. It was a beautiful, clear morning with just a hint of a “sunrise”…enough light to see by and some beautiful pinks and purples starting to form. After pulling our layers back on, we trudged over to a cabin where breakfast was served. Fresh bread right out of the oven, homemade jam, hardboiled eggs, meat and cheese, and hot coffee perked us right up—as did this gorgeous cozy view! After eating our fill, we bundled back up and headed toward the pups. It was time for our dog sledding adventure! They were antsy and ready to run! 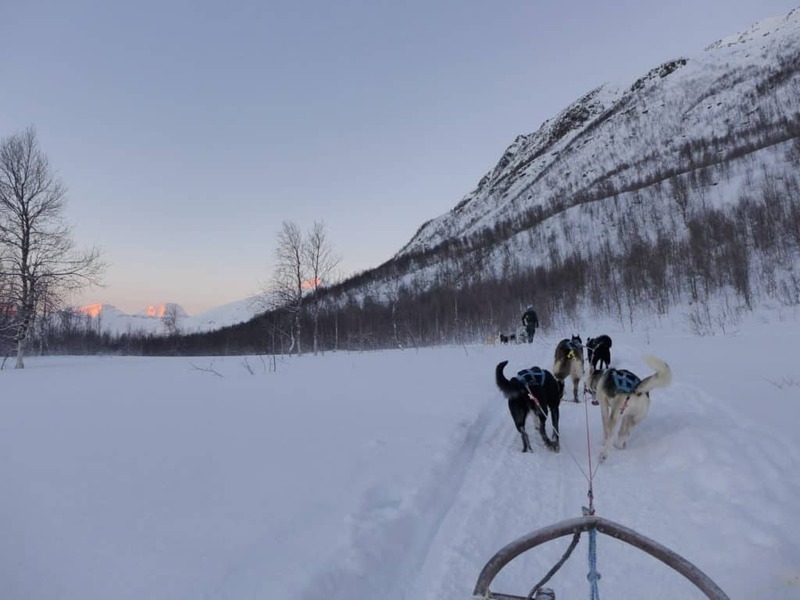 Our guide got us paired off and assigned to different sleds, and we finally got to meet our dogs and get them harnessed. Then we took off into the cold, clear morning. 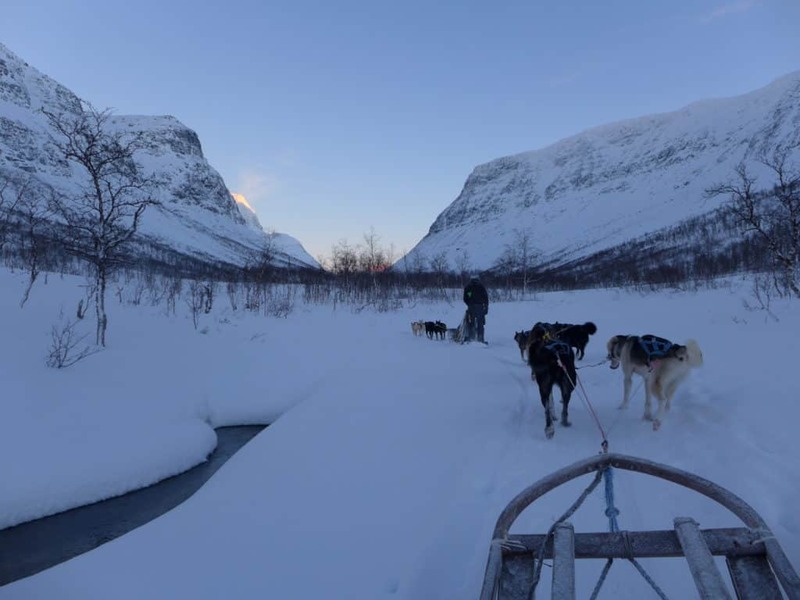 It was mostly silent, with only the crunch of snow under the sled and padding of the dogs’ paws, along with my own breathing. I couldn’t stop staring at how the tiny bit of “sunrise” lit up the mountain peaks. I’ve written a ton more about the experience here, it was amazing! I had to ride the brake more than I wanted, but was following the guide and he kept having to slow down because folks in the back weren’t keeping up. The dogs definitely wanted to go faster (as did I! ), but they were clearly having a blast, and we flew along pretty well. We got the dogs unharnessed and back in their little houses, and gave them some love. Then, frozen and hungry, we headed back to the communal lavvu for coffee, bread, and fish soup. 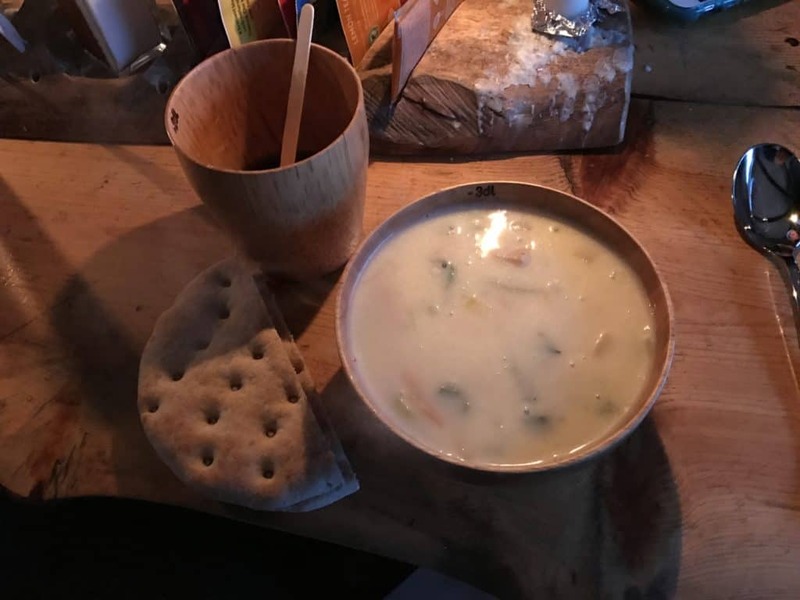 Fish soup, BTW, is amazing and I had no idea before going to Norway, where I ate it approximately every-other meal. 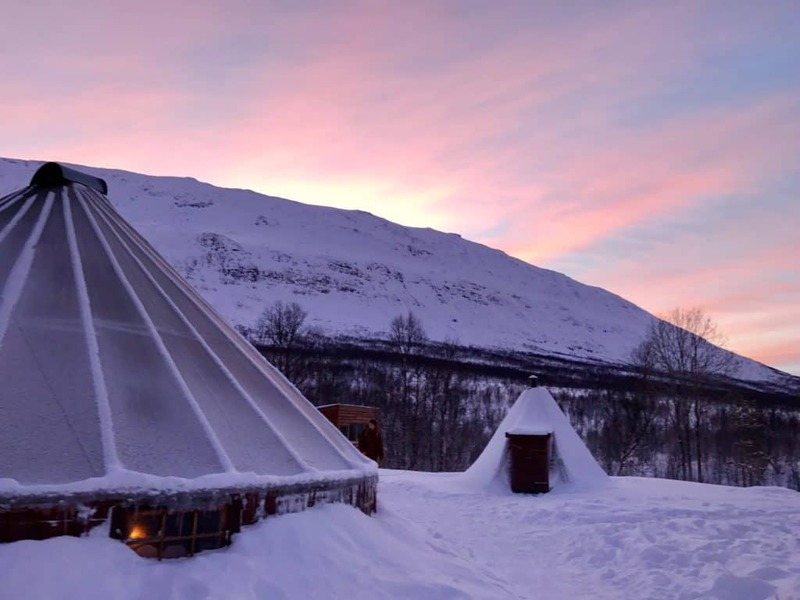 After stuffing myself with fish stew and lefse, it was sadly time to leave Camp Tamok and head back to Tromsø (for us, to catch our flight). 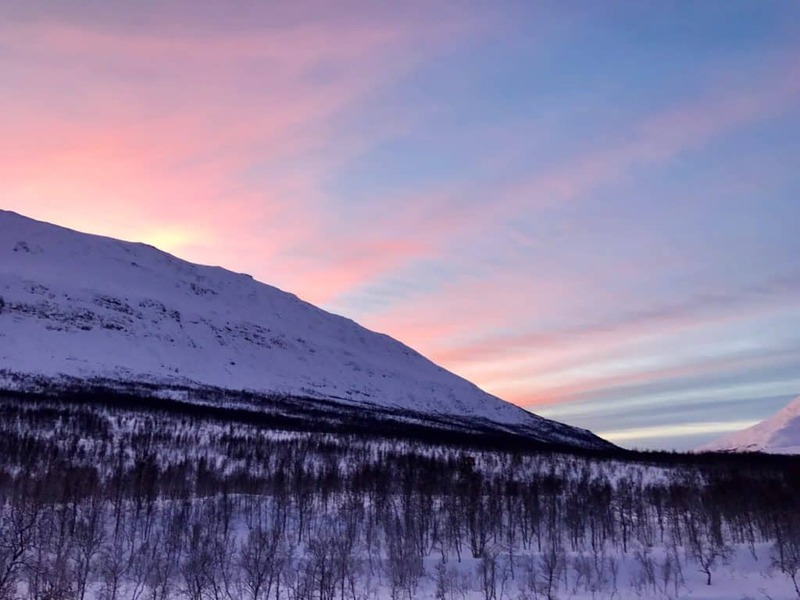 To give you an idea of what Polar Night is like, this is what the sky looked like at approximately 1:00 in the afternoon as we were boarding the bus. By the time we got back to Tromsø at 2:30, it was already pitch black. That’s a pretty amazing sendoff to a pretty epic 24 hours. 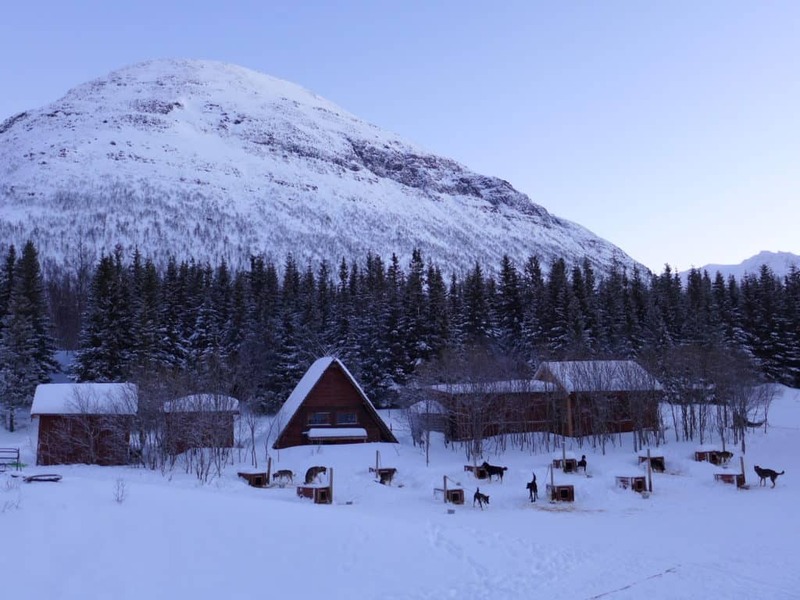 There are a couple of companies that offer dog sledding in Tromsø, but we booked with Lyngsfjord Adventures and were super happy with the overall experience at Camp Tamok. 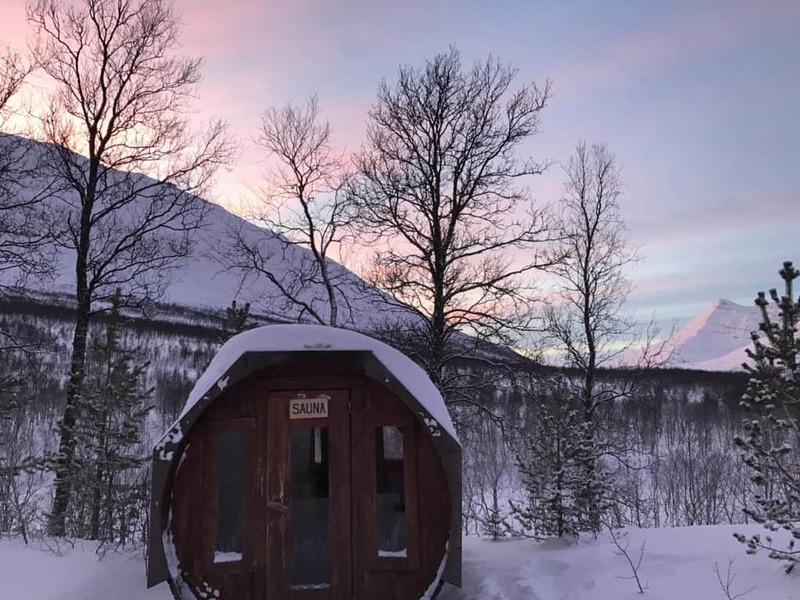 You can do just a day trip, but one of the biggest reasons we selected them was that they offered an overnight option in a lavvu (the other was great dog sledding reviews). 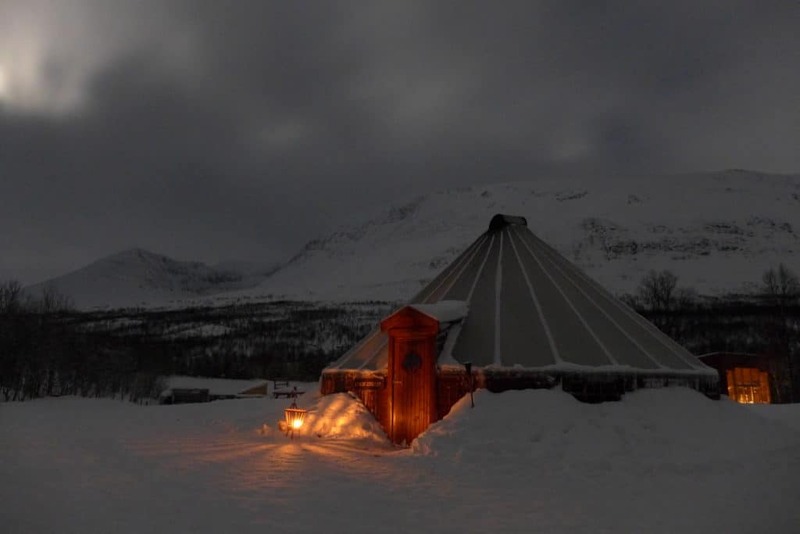 Sleeping on reindeer skins in a sami tent is pretty cool, though a little hard (my bad hip was not super happy with me). If you do the overnight stay, you have to pick a nighttime and then a morning activity as part of the package. 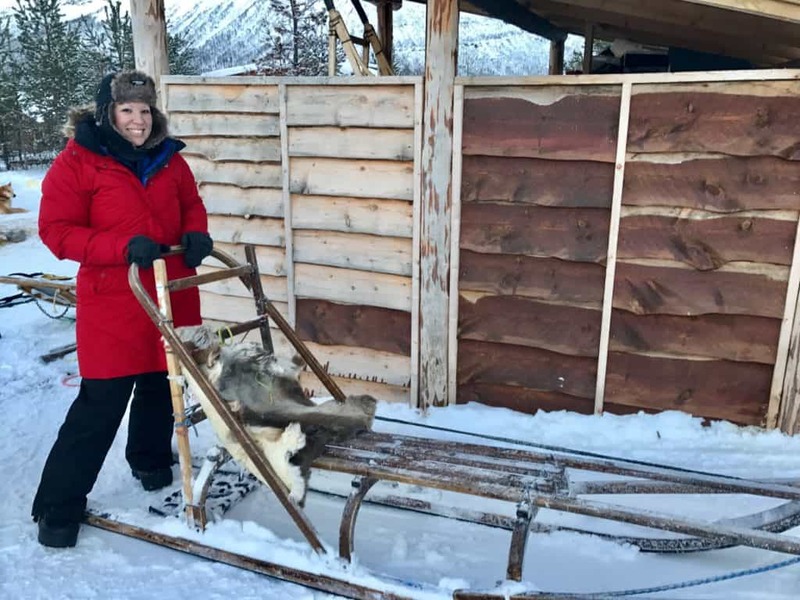 We did a Northern Lights tour and dog sledding. 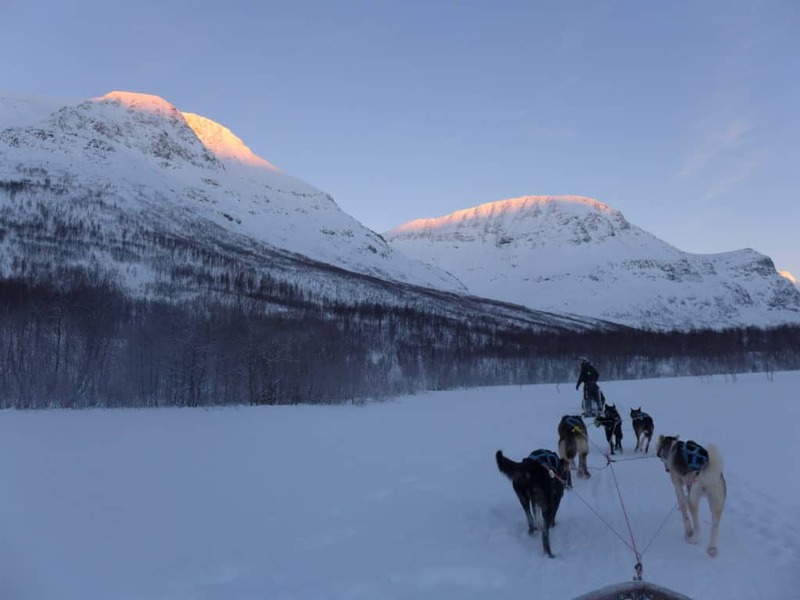 I’d do dog sledding again in a heartbeat, but would do snowmobiles or reindeer sledding instead of the Northern Lights tour. You have pretty much the same chance of seeing the Northern Lights since the tour is so short, so I didn’t feel it was worth the money. The total cost per person for the Northern Lights tour, overnight stay, dog sledding, and two meals (dinner & breakfast) was around $465. Yeah, you read that right. 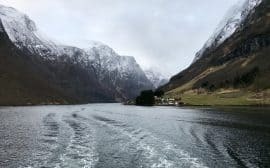 This was a definitely splurge—and everything in Norway is expensive—but it was a bucket list kind of experience for us. Not perfect by any means, but wonderful and unique all the same. 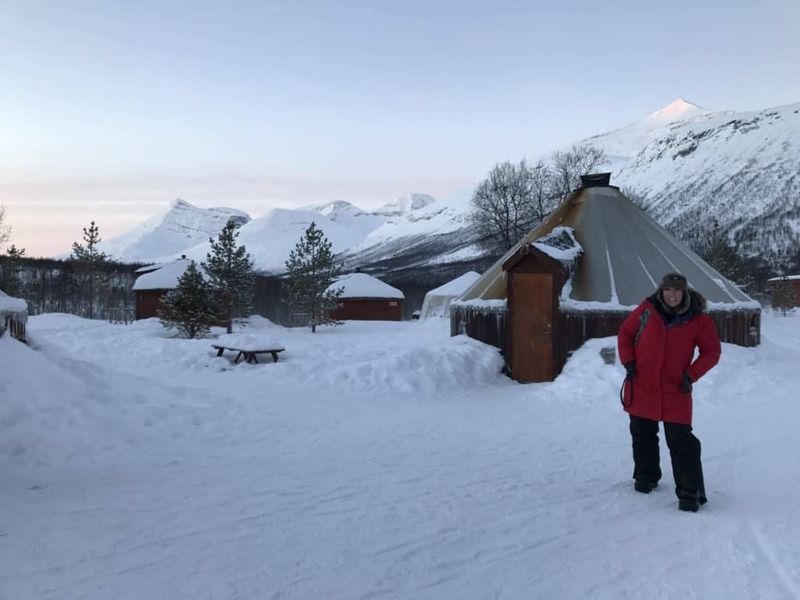 I’ve written an in-depth Arctic packing list that runs through all the winter gear you’ll need, what brands worked for me, and everything else you need to know to plan your visit!